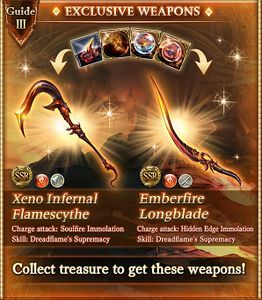 Xeno Ifrit Clash is a clash event that rewards items used to trade for the Xeno Infernal Flamescythe and Emberfire Longblade weapons. 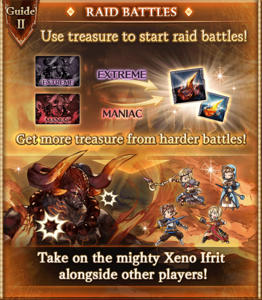 It is an expansion of the Ifrit Showdown and the associated battles are also available during the event. This event is fairly difficult for new players, with Xeno content being harder than the basic Showdown and extremely punishing to players without Water teams. If nothing else, purchase the 20× Half-Elixirs; they provide much more AP than is needed farm them. Xeno Infernal Flamescythe has a Massive EX ATK boost, a powerful Charge Attack, and at 3★ can be forged into the True Infernal Flamescythe, one of the best Fire weapons in the game and an incredibly useful weapon in common Berserker Fire team compositions as it provides DA/TA and synergizes with its own Burned effect. Obtaining enough copies to 4★ a Flamescythe should be an absolute priority for any HL-level players interested in Fire. Depending on your grid and party build, a second True Flamescythe may also result in a damage gain for your grid due to its excellent stats, axe typing and EX multiplier; consult the Damage Formula page for more resources in determining if a second Flamescythe will be beneficial to your build. For newer players, even one copy is an excellent addition to most grids or as a mainhand, and can feasibly be obtained by leeching the Event Raid or defeating NM70 a few times (if possible). 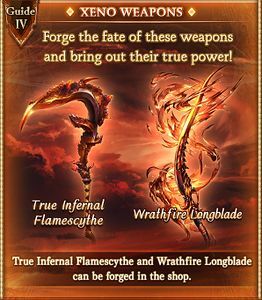 If you are able to defeat Extreme and NM70 consistently, even if just barely, then diligent effort for the span of the entire event will likely result in enough weapon copies to forge the True Flamescythe, which will give you an overwhelming spike in power in Fire. Ifrit is an excellent summon for new players, offering a respectable 60% Elemental ATK aura to Fire teams and an decent ATK Up call and base stats for everyone else. 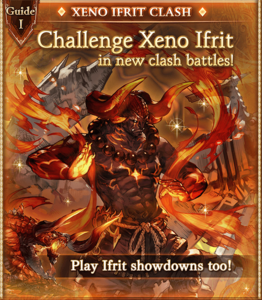 Play Xeno Ifrit Clash and Ifrit Showdown at the same time! Clash battles are harder than showdowns. When you are able to clear extreme- or maniac-difficulty showdowns you should be able to take on Xeno Ifrit (NB: Xeno Ifrit's resistance to elements other than water is notably high, meaning this statement is more of a guideline than hard truth). Xeno Ifrit maniac-difficulty will unlock after clearing extreme-difficulty. Xeno Ifrit now has 50% damage resistance to all elements except for water. If unlucky, focus on maximizing the number of Infernal Vajra and True Xeno Ifrit Anima received. Do both of the daily maniacs (Xeno and Old Ifrit). Do the highest Nightmare possible to maximize Infernal Vajra drops. 0 AP ~1200 EP ~400 raids needed for the Infernal Vajra. Scorching Peak 190 340 Enough will drop while just triggering NM. Infernal Garnet 40 40 Save 40 for forging, use the rest liberally to host raids. Infernal Vajra 45 80 Requires 12-25 NM120 or 35-60 NM70. Ifrit Anima 100 100 Enough will drop while just triggering NM. Ifrit Omega Anima 90 160 Farm extra EX/NM70 as necessary. Do the Maniacs. True Xeno Ifrit Anima 23 43 Leeching raid nets ~0.4 True Xeno Anima. 60% in red chests. Medium Fire damage to all allies. Medium Earth damage to all allies. Inflict ?? ?Verification needed. to all. 5-hit Fire damage to random allies. Multi-hit, large Fire damage to random allies. Plain damage to one ally based on 55% of ally's maximum HP. Massive multi-hit fire damage to random allies. 20,000 Fire damage to one ally and inflict Soulfire ImmolationKnocked out after 5 turns. Soulfire ImmolationKnocked out after 5 turns. Fire damage to all allies and inflict ?Verification needed. . Plain damage to one ally based on ally's HPVerification needed. .
Large Fire damage to one ally and inflict ?Verification needed. .
~2700 Fire damage to random allies, 15 times. 65,565 Fire damage to one ally and inflict Soulfire ImmolationKnocked out after 5 turns. Exhaust II N 100%－50% Verification needed. 10-hit Fire damage to random allies. Hellfire N 50%－ Verification needed. Crimson Drops N OD 100%－50% Verification needed. Fire V OD 100%－50% Verification needed. Soulfire Immolation TR OD 50%－Verification needed. 65,535 Fire damage to one ally and inflict Soulfire ImmolationKnocked out after 5 turns. Only triggers for the one player that brings Xeno Ifrit into OD. Cost to Host: 0 AP Unlock: May appear after clearing Xeno Ifrit Extreme or Xeno Ifrit Maniac. Cost to Host: 0 AP Unlock: Clear Nightmare Lvl 70. May appear after clearing Xeno Ifrit Extreme or Xeno Ifrit Maniac. Cost to Host: 0 AP Unlock: Clear Nightmare Lvl 100. May appear after clearing Xeno Ifrit Extreme or Xeno Ifrit Maniac. The event shop sells the Ifrit summon and Fire weapons. Items restock with higher costs when sold out. Ifrit are supernatural creatures in some Middle Eastern stories. In Islam, this term refers to the most powerful and dangerous Jinn. Xeno Ifrit wears a japamala which is a string of prayer beads commonly used by Hindus, Buddhists, Jains and some Sikhs for the spiritual practice known in Sanskrit as japa. It is usually made from 108 beads, though other numbers are also used. Xeno Ifrit's humanoid appearance as a monk wearing a japamala and the overall theme of fire may be loose reference to the act of self-immolation, a practice tolerated by some elements of Mahayana Buddhism and Hinduism. EnglishThis is an amateur, unofficial translation. Battle Start 我ガ名ハゼノ・イフリート。真ナル焔ノ権化ナリ I am Xeno Ifrit, the avatar of the True Flame. 矮小ナル者ヨ、潔ク塵ト化セ Puny ones, bravely turn to ash. 自ラ灰トナリニ来タカ、愚カナ人ノ子ヨ Foolish Children of Man, willingly coming to be turned to ash. Entering Overdrive 真ナル焔ノ力、見セテヤロウ！ Witness the power of the True Flame! サア、精々足掻イテミセロ！ Come, show me the best struggling you can muster! Crimson Drops 真ノ灼熱ヲ其ノ身ニ刻メ！ I shall engrave the scorching heat into your bodies! Soulfire Immolation 紅焔ヨ、全テヲ灰ニ還スガ良イ！ Crimson flame, return it all to ash! Hellfire 我ガ焔ニ逃ゲ場ナド無イ！ There is no escape from my flames! Inferno 足掻ケ！苦シメ！ソシテ祈ルガ良イ！ Struggle! Suffer! And pray! Fire V 業火ニ溺レロ！ Drown in the fires of hell! 未ダ我ガ焔ハ消エテハイナイ…！ None have yet been able to extinguish my flames! 我ガ焔ヲ…抑エルカ… Have my flames… been held back...?